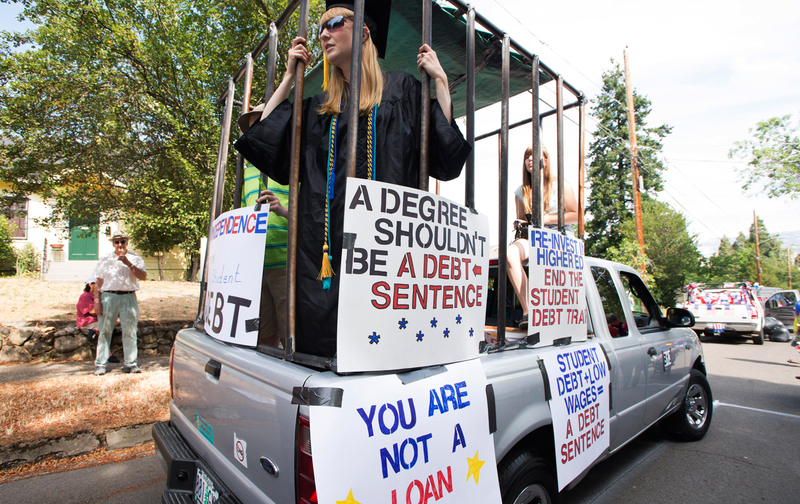 There’s nothing normal about graduating with massive student-loan debt. I came to this country as an immigrant from India to go to college. My parents used all their savings to send me here because they knew what we all know and what we all tell our kids: If you want a good job, you’ll need more than a high-school education. Whether it’s a two-year, a four-year, or a vocational institute, the reality is that in today’s world, you must get more than a high-school diploma. The unfairness of it, though, is that getting that advanced degree has become completely unaffordable. Today, our young people are making untenable choices: going to college and taking on mountains of debt, or forgoing the college degree to work part-time or minimum-wage jobs that simply won’t allow them to build a future. Or, if they go to college and come out with an average of $30,000 per person in debt, they live in perpetual fear. That choice hurts not only our young people; it hurts our families, our communities, and our economy. It wasn’t always that way. Getting a college degree used to be free, or low cost, because as a society, we saw providing higher education to young people as an investment—in them and in the future of our own country. More people with good educations meant more trained workers. More trained workers meant more jobs filled. More jobs meant more money back into our economy. And of course, better jobs ultimately meant people could have a better future, raise a family, and live with economic security. We were investing in a cycle of prosperity. That’s why places like the City University of New York and the University of California used to be free. That’s why we invested in the GI Bill to cover college costs for millions of veterans. That’s why we invested in Pell Grants to help cover more than half the cost of tuition at public colleges, helping our lowest-income students and millions more to be the first in their families to attend college and have the promise of a brighter future. And because of that investment, we led the world in terms of the percentage of young people with college degrees. Today, we’re 11th, and the trend is continuing downward. In-state tuition at four-year public colleges has almost quadrupled, and state spending on public colleges is at its lowest rate since 1980. If current trends continue, spending on public colleges could drop to zero in some states by 2022. Pell Grants today only cover about 30 percent of the cost of attending a public institution—and a full 83 percent of all students attending public universities graduate with student debt. Too many people stay in debt their entire lives—a recent study found that there are 3 million older adults still with student-loan debt, seeing their Social Security earnings garnished. And students of color and low-income people are hit especially hard. It is absolutely unacceptable that student debt in America today totals a staggering $1.3 trillion—even more than credit-card debt. In my home state of Washington, tuition at the University of Washington grew five times the rate of inflation over ten years, before it was frozen in 2013. While I was in the State Senate, we worked together to boost state spending enough to lower tuition by 5 percent, and the state is continuing to do this, but we need more. We need to incentivize states across our country to spend on higher education, and ensure that we go back to allowing people to go to college tuition-free. That’s what our bill does. The College for All Act takes the agreement we built into the 2016 Democratic Party platform and codifies it into legislation. The bill creates a federal-state partnership where the federal government provides 2/3 of the cost of college tuition for all students and the state provides 1/3. We do this for families earning up to $125,000 per year—which covers about 80 percent of students. By the way, our plan also recognizes the unaffordability of non-tuition costs—fees, books, housing—and allows for students who receive maximum Pell Grant awards to apply them to those expenses. We include tribal and historically black colleges and minority-serving institutions because we know how important these institutions are to educational equity. And all students, regardless of income, who want to attend a two-year community college would do so completely tuition- and fee-free. Another thing that’s not rocket science—we cut student-loan interest rates in half for new borrowers and we allow existing borrowers to refinance student loans at those same rates. Profiting from student loans is usury, and we just can’t continue to allow it. Our bill also triples our current investment in the Work Study and GEAR UP programs, because we know that we have to particularly target help to our low-income and first-generation students and that these programs have been enormously successful. This bill creates a new normal. There’s nothing normal about not being able to refinance a student loan for a lower rate, when your own federal government profits off your student loans to the tune of $127 billion in profit, according to the Congressional Budget Office! The stories I have heard from my constituents are horrifying. Lillian, who made every payment on time until she ended up in the hospital with heart failure and had to choose between paying her health-care bills or paying her student loans, and so went into default. Susan, who is a public-school teacher and has over $80,000 in student-loan debt and is dealing with the sale of her loans to predatory lenders and lives in fear of being homeless. Sydney, first in her family to go to college, a National Merit Scholar, and living with a physical disability, can’t make her payments or fulfill her dream of going on to law school to become a civil-rights lawyer. Hanna, first to go to college, wanted to be a teacher but gave up that dream and dropped out because she realized she would forever be in debt. This is simply not right. The College for All Act renews our compact with our young people—and really, with our futures. We’re going to piece back together the broken promises of a broken American Dream, and give back hope and opportunity to the middle class and working families across this country. I’m proud to be the sponsor of this legislation in the House and I look forward to building a strong bipartisan coalition of people who commit to taking on this horrendous and unfair crisis.